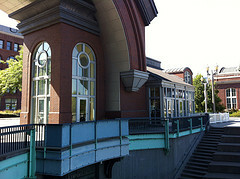 Anthem Coffee & Tea at 1911 Pacific Avenue, Tacoma, in front of the Washington State History Museum has been open since November 2011. Dear daughter and I visited today to purchase delicious drink treats and to share a tasty sandwich, which came from Joseppi’s. 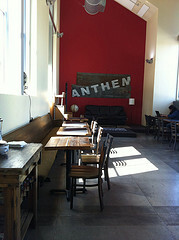 Anthem has a nice vibe to it, stylish and comfortable. And the folks behind the counter were super nice! This entry was posted in Coffee Shops, cafes and bistros, Restaurants, Tacoma, WA State - Pierce County and tagged Anthem, Anthem Coffee and Tea, Avenue, brick, coffee, Pacific, Tacoma, Tea on July 26, 2012 by admin.